If you watched the first CFP Semifinal game between Oklahoma and Georgia, chances are the excitement and drama had you a little worn out by the time the Sugar Bowl started. When it finally did, it quickly became clear who had the upper hand. Alabama’s defense may have had some issues towards the end of the regular season. But the unit was relatively healthy against Clemson—and it showed. The Alabama defense held Clemson to three and out and zero total yards on their first three drives of the game and never really let up. 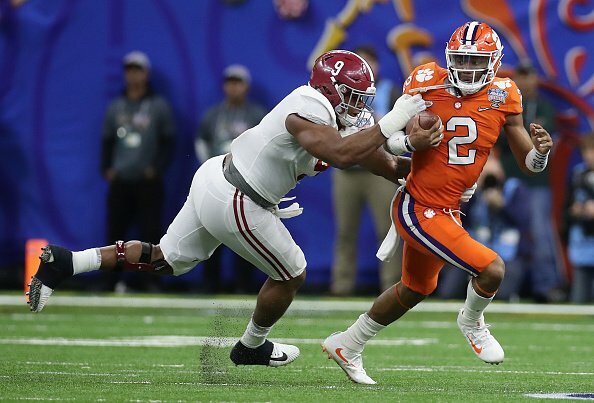 After Jalen Hurts led the Alabama offense to its first touchdown of the day late in the first quarter to take a 10-0 lead, Kelly Bryant was finally able to get the Clemson offense moving. But the drive stalled at the Alabama 27-yard line and the Tigers had to settle for a field goal. However, with the score just 10-3, Clemson was still in the game. They just needed their defense to step up and stop the Alabama offense. Bryant would need to keep the Tigers moving on offense as well. Alabama attempted another field goal late in the second quarter but missed making the score at halftime 10-3. When the second half started, it appeared that Clemson might finally have the break they needed after forcing Jalen Hurts to fumble on the first play from scrimmage. But much like they did in the first half, the Alabama defense shut Clemson down. After losing five yards on three plays, they settled for a field goal. Clemson appeared poised and ready to break the game open on their next drive. Bryant got the offense moving for a few plays. But then the Alabama defense did what it has become infamous for under Nick Saban. They created an opportunity for the offense when 308 lb. 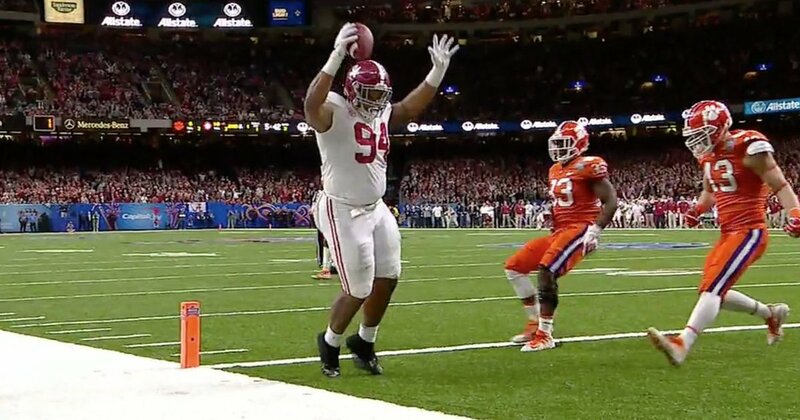 defensive lineman Da’Ron Payne intercepted Bryant and rumbled 21-yards before being pulled down. A penalty moved the ball up to the Clemson 27. The Tigers defense made them work for it, but seven plays later Payne caught a one-yard pass for the touchdown and gave Alabama a commanding 17-6 advantage. But Clemson was far from out of it at this point. They did, however, need to get the offense on track and put up some points on their next drive. Instead, Alabama linebacker Mack Wilson intercepted Bryant on Clemson’s first play and returned it 18-yards for a touchdown. There was still 5:27 left in the third, but the writing was on the wall. The Alabama defense had a mission in mind. This time, the game was not going to be a high scoring affair (like the last two games against Clemson). Alabama’s offense didn’t come close to scoring again, but neither did Clemson’s. The Tigers never really threatened but did get within range on their final drive. However, the Alabama defense kept them out of the end zone to make the final 24-6. Jalen Hurts and the Alabama offense did not do much (16-24 for 120 yards and two touchdowns; 42 total rushes for 141 yards on the ground). They didn’t need to do much with how the defense shut down Clemson (188 total yards with just 63 rushing on 33 total carries). But they are going to be put to the test next week when they face Georgia in the Championship game. The Bulldogs feature a dynamic pair of running backs that will be coming off a Rose Bowl performance that saw them combine for 326 yards and five touchdowns on 25 combined carries against Oklahoma. Oklahoma’s defense is nothing like Alabama’s, of course. But the Crimson Tide will be facing a head coach in Kirby Smart that is familiar with how they do things. Georgia’s Kirby Smart is a former Alabama defensive coordinator. Then again, Saban has never lost to one of his former assistants. Alabama has opened as a four-point favorite to win.